I love working with scraps, and 2.5" squares are my favorites to use. For me, playing with simple patchwork scraps has been valuable in experimenting with color and value and useful in jumpstarting creativity. I turn to patchwork when I am feeling short on ideas but really need the therapeutic benefits of sitting at my machine and stitching pretty pieces of cloth together (can I get an "amen" for sewing therapy?). My scrap basket dedicated to 2.5" squares. Basket measures 14"x12"x7" and no matter how many scrap projects I do, I feel like a barely make a dent in this pile! 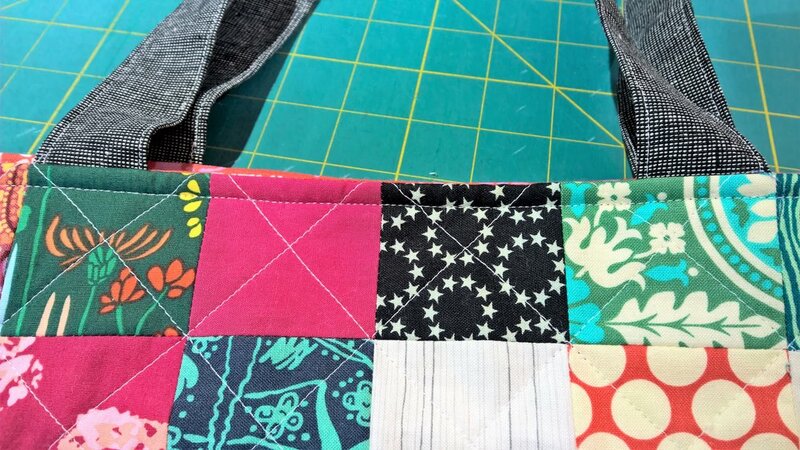 Today I want to share one of my favorite scrap projects: the Patchwork Tote Bag! In my hometown, we have a ban on plastic bags and stores charge a $0.05 fee for each paper bag they provide to encourage shoppers to bring their own reusable bags to reduce the environmental impact of single-use bags. After lots of trial-and-error in making grocery and tote bags, this is my go-to size. Ready to make your own? Truth to be told, when I snapped this pic it was 50 degrees and raining; can you tell I'm looking forward to sunshine?! - I recommend using a walking foot and 90/14 needle to smoothly handle all the layers. 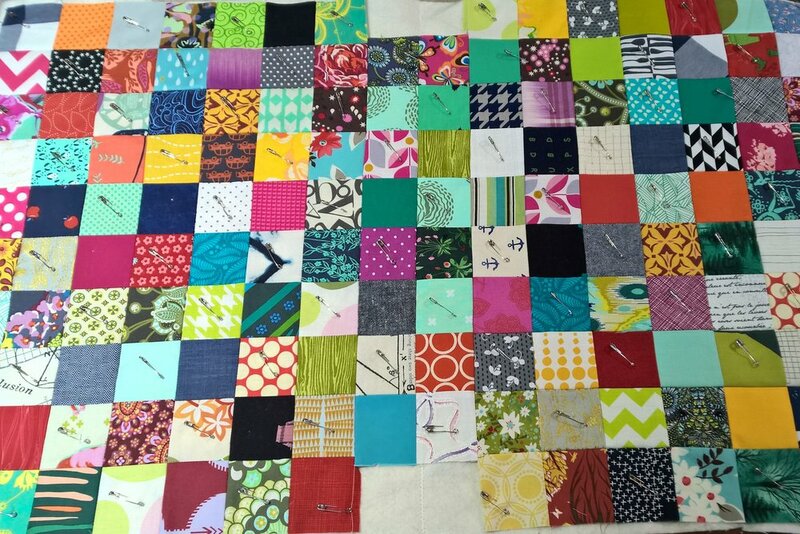 Step 1: Sew patchwork squares together to form rows. For each panel, you will need to make 7 rows of 10 squares and one row of 8 squares. Seams may be pressed open or to the side to suit your preference. Step 2: Pin patchwork panels together along the row of 8 squares. Sew panels together using 1/4" seam allowance. Be sure to match seams and pin at each intersection. This is what your completed patchwork panel should look like to make the exterior of your bag. Step 3: Place patchwork right side up on top of batting. Baste and quilt as desired. 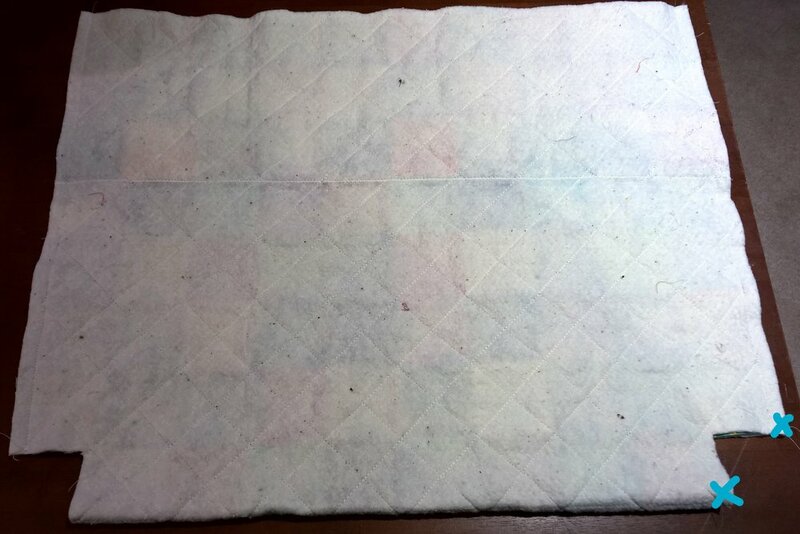 I chose crosshatch quilting in white thread. Step 4: Trim excess batting from edges of patchwork panels. Step 5: Fold patchwork panel in half right sides facing. Pin along the sides. Be sure to match seams and pin at each intersection! 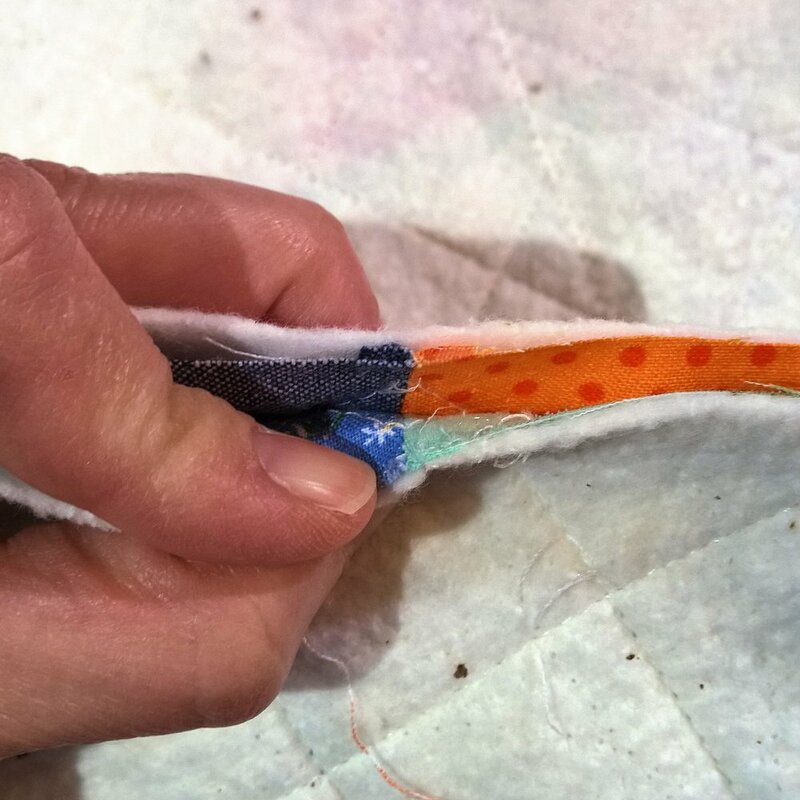 Sew along each side seam using 3/8" seam allowance and your walking foot. Press seams open. Pin and sew down just the side seams; don't sew along the notched corner at the bottom. We'll box this corner next! 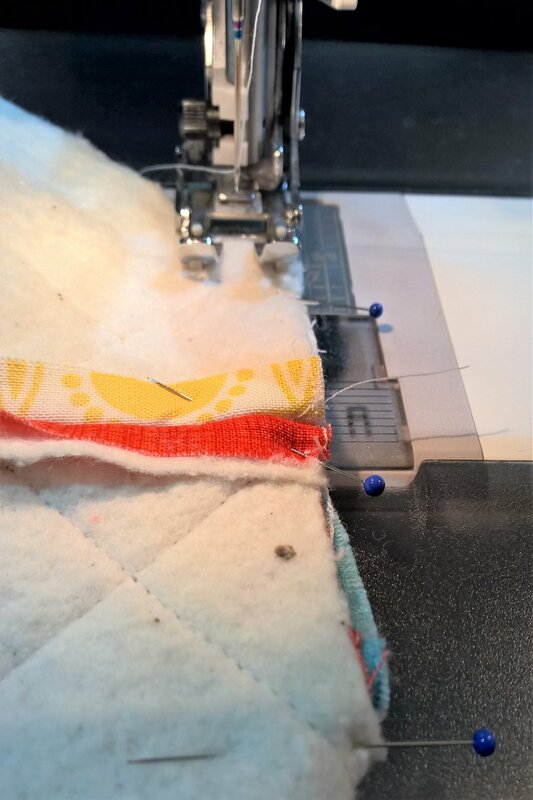 Match seam and pin at each patchwork seam intersection. Step 6: Now we're going to box the corner to make our bags roomy enough for a trip to the store! Pinch the notch at the bottom corner to align the bottom and side seams (be sure to match & pin seams of your patchwork for a polished look). Sew this corner shut with a 3/8" seam allowance. Repeat for the other side. Turn exterior right-side-out. Meet the bottom edge of the side seam you just sewed to the bottom edge of the notched corner (marked with blue "X"s in the photo). Match the seams from your patchwork and pin. This is what your pinned corner should look like. Stitch corner shut using 3/8" seam allowance. This is what your corner should look like now. This is what your finished corner, or side gusset, will look like when turned right-side-out. Here's what your patchwork exterior should look like now! Time to move on to the lining! Step 7: Cutting the lining fabric. 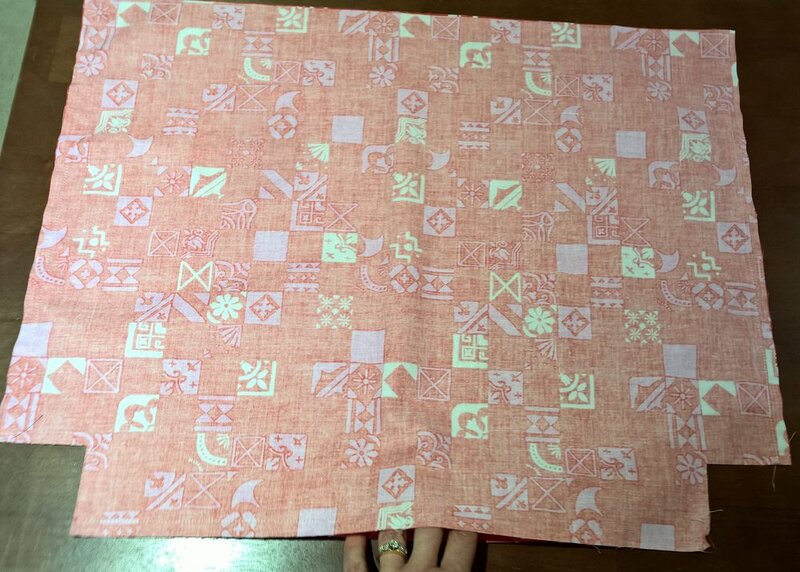 With your 1/2 yard of lining fabric, place WST and cut 16.5x20.5" rectangle. 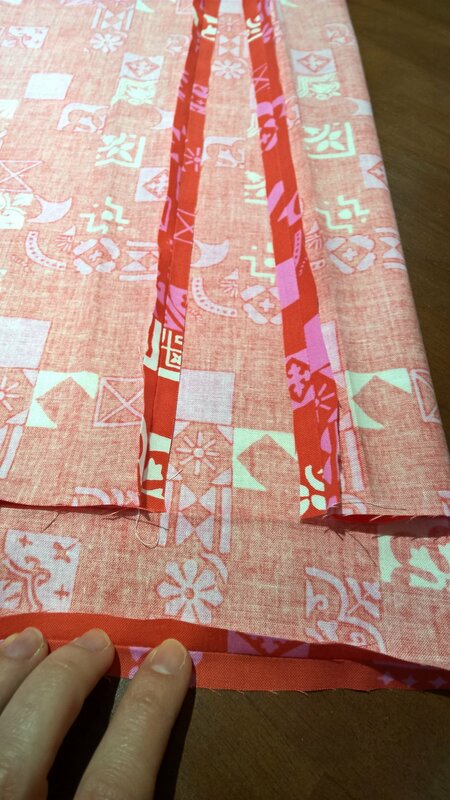 We want to cut a notch in the bottom corners so that we can box the corners of the lining (just as we did in the patchwork panels). To do this, measure and cut a 2.25"x2.25" square in the bottom left and right sides along the 20.5" edge. Here's my lining (don't you love this cute Cotton + Steel Clover print?) with my corners notched to allow me to box the corners for the side gusset. Measuring to cut the notched corners. Step 8: Pin lining panels RST along side seams just to notched corner. Sew side seams closed using 3/8" seam allowance. Press seams open. I left my walking foot on for this part because I was too lazy to change back to my regular foot, keeping it real! Pinned at bottom leaving an opening for turning. Bottom of lining sewn leaving an opening for turning. Step 10: Time to box both corners of the lining following the same procedure we did with our patchwork panels. Match side seam to bottom seam and pin. Sew using 3/8" seam allowance. Step 11: Time to make the handles! Cut 5"xWOF along the fold. I used Essex Homespun linen in black for my handles; pretty much every tote bag I make has Essex yarn-dyed linen handles! Step 12: Pressing the handles. Open your fabric so that you have a piece that is 5" by approx. 40-42". Now fold in half lengthwise (WST) and press a center crease. Open your fabric. 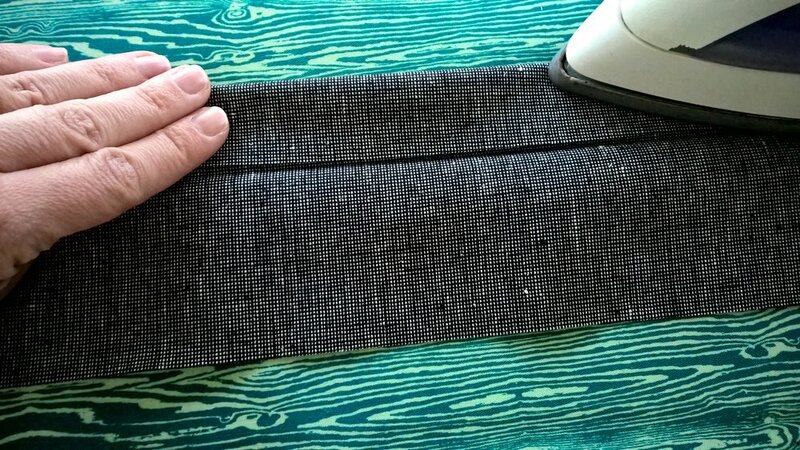 Fold the top half of the fabric lengthwise (WST) down to the center crease and press. Now press bottom half of fabric up towards center crease. Fold top half down to meet the bottom half along the center crease and press. 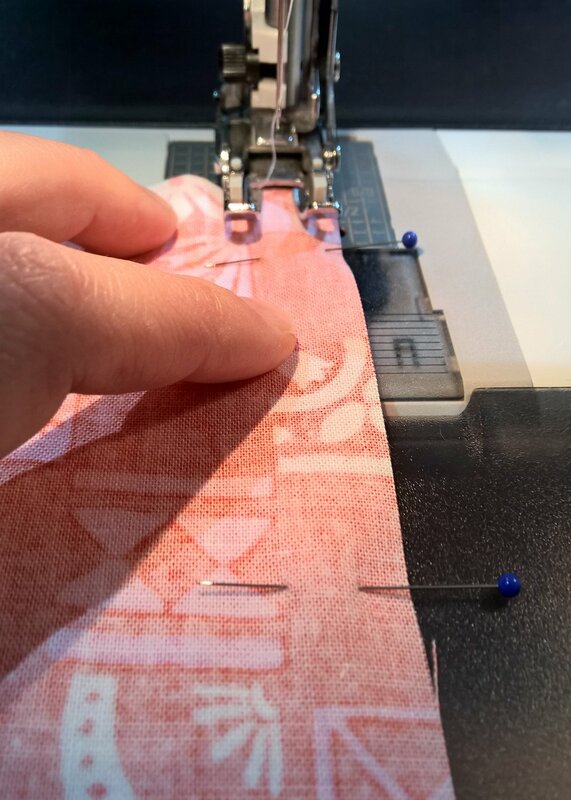 Pressing a center crease after folding fabric in half lengthwise. Pressing top half toward center crease. Pressing bottom half towards center crease. Top half folded down along center crease to meet bottom half and pressing. Step 13: Edgestitch along both long sides of handle. Now you should have one LONG handle! Step 14: Time to turn that long handle into 2 shorter handles! Match the short ends of the handles and fold long handle in half. Cut handle in half along folded loop. Now you should have 2 handles of matching length. Cutting long handle in half. Step 15: Time to put all those pieces together! Pin the handles to the top of your patchwork panels about 2-2.5" from the center; I used the edges of my patchwork pieces as a guide. Be sure your handles aren't twisted here! You can baste your handles in place now if you like. Slide the lining over the patchwork exterior (RST) and pin at the top. Sew around the top using a 3/8" seam allowance. Handles tucked between patchwork and lining. Step 16: Pull the exterior out through the opening in the bottom of the lining. Pin the opening of the lining closed and edgestitch using 1/8" seam allowance. Step 17: Finishing touches! Push the lining down into the exterior and press at the top. Top stitch around the top edge of the bag. And your bag is ready to be loaded up for your next grocery store run, trip the library, or adventure to the park! I'd love to see your finished bags, so send me a link or tag me on IG (BranchVineHandmade) to share your work! I'm already working on another controlled scrappy version of this bag, so follow me on IG to see how that iteration turns out!